One technique that’s bound to be much in evidence in therapy clinics this Fall and Winter is the use of kinesiology tape. Many Physical Therapists are adding to their skills portfolio by embarking on Kinsiology Taping Training. As the weather begins to change physical therapy clinics will, no doubt, see an increase in patients who have had slips, falls, sprains and strains. Adrenalin junkies who participate in some of the most spectacular Winter sports, including ice hockey, snowboard cross, short-track racing, alpine freestyle skiing and, of course, bobsleigh know that they’ll see their fair share of injuries as well as snow too! But one thing that they have in common is, regardless of their age or their sporting ability, that they can use Kinesiology Tape to add their Physical recovery from Winter accidents. Ever since it became popular at the 2008 Beijing Olympics, Kinesiology Tape has become almost de rigueur with elite athletes across a range of sports. Athletes seen wearing the tape include the likes of footballers David Beckham and Mario Balotelli, German beach volleyball star Katrin Holtwick, and tennis players Serena Williams and Novak Djokovic. Japanese chiropractor and acupuncturist Kenzo Kase, who invented the Kinesio Taping Method back in 1979, says he came up with the tape design because he found standard taping techniques, like conventional strapping, too restrictive for his patients. According to Dr Kase, although standard strapping provides muscle and joint support, it limits movement and gets in the way of the healing process. Kinesiology Tape can be applied to different areas of the body, allowing muscles, ligaments or tendons to relax by restricting the flow of inflammatory fluids below the skin. Kinesiology tape is different to traditional sports tape because it lifts the skin to assist this lymphatic flow, which, in turn, reduces pain and swelling. 3B Kinesiology Tapes are made from cotton rayon fibre and are latex-free and hypoallergenic. 3BTape is perfect for kinesiology taping, acu taping and sports taping. They have a skin-friendly, thermoplastic wave-like acrylic adhesive on one side. The wave-like adhesive is used to push sweat and moisture away from the kinesiology tape. This means that 3B tapes are water resistant, air-permeable and do not come off in the shower, pool or sauna. They can be stretched lengthways by approximately 130-140%! and it can help prevent excessive protraction injuries, for instance shoulder problems from activities like playing tennis. Because of the wide range of applications, Kinesiology Tape can be used for patients of all ages. 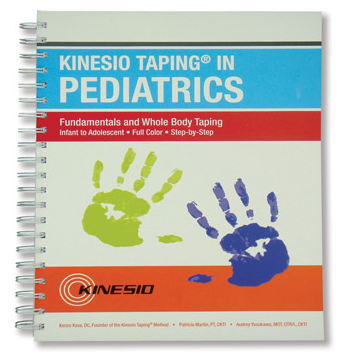 As you’ll see by our Kinesio Taping Manuals, Physical Therapists can apply these skills to give additional support for their treatment of pediatric cases right through to geriatric patients. Have you thought about adding Kinesiology Taping to widen your Physical Therapy skills? By Joanna | September 25, 2014 | Sports . Therapy | 1 Comment | Tags: "3B Scientific", "continued education", "kinesio tape", "kinesiology tape", "kinesiology taping manuals", "learn kenesiology taping", "physical therapist", "physical therapy", "pre-cut tape", "sports injuries", "sports tape", "winter accidents"
the kinesiology tape is a welcome addition tohelp athletes in high contact sports like rugby and football too. it could really do us good here i Kenya. how can i get it?